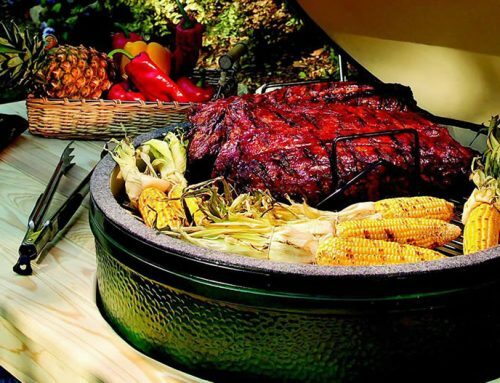 The Weber Smokey Mountain smoker (WSM) is a charcoal smoker that has won the praise of users far and near and it is much deserving. I have the 22.5 inch version but there is also a smaller unit that is only 18 inches in diameter if you are wanting something a little smaller. This smoker takes everything that is wrong with most other bullet water smokers and comes out of the box ready to run like a champion even if you are an amateur smoker enthusiast. Many smokers in this category must be heavily modified to make them work as they should including drilling holes in the charcoal pan, adding on a suitable temperature guage, and even moving legs and other components from where they were originally designed to be. This smoker comes out of the box, requires very little assembly and can be in use in a very short time. If I sound like I really like this smoker, it's because I do. 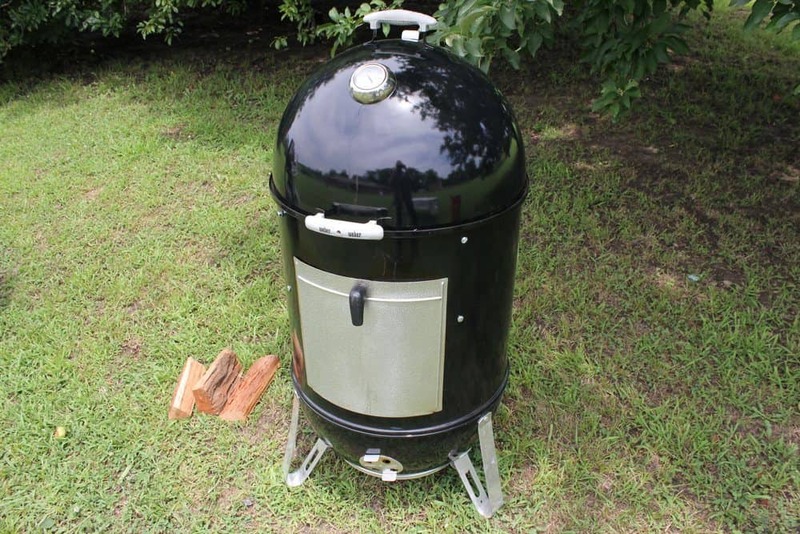 I have done everything from chicken to brisket to ribs in this unit and it just does an absolutely fantastic job even on those things that require 16-18 hours to cook. In these instructions, I want to show you how to get started by adding charcoal, lighting it and maintaining the target temperature. 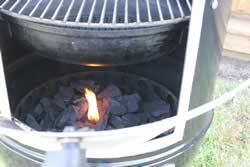 Add lump charcoal to the charcoal bowl then place a piece of firestarter down in the center of the charcoal and light. 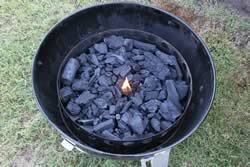 Let the fire go for about 5-7 minutes then place the middle section on top of the charcoal bowl or bottom section. I usually pile a little of the charcoal around and over the flame to help it catch better. 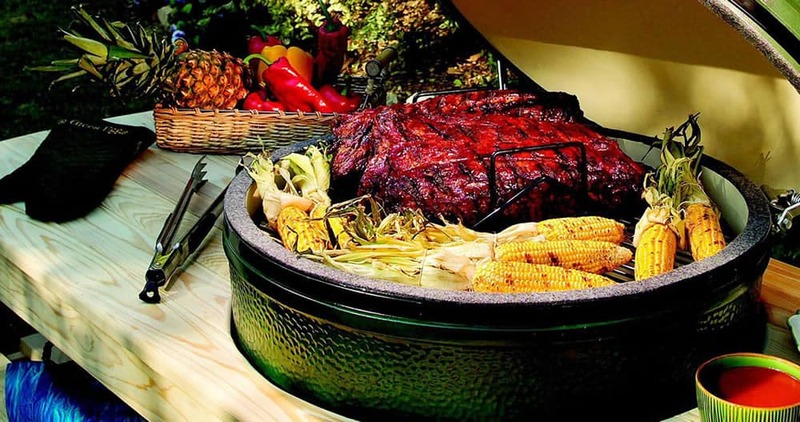 Fill the water pan with about 2 gallons of cold water then right when you place the food on the grate, place a stick of wood or 4-6 fist sized wood chunks on top of the charcoal in close proximity to the center. 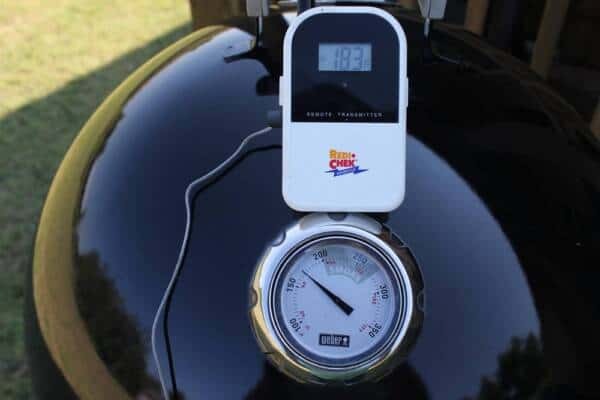 Place the lid on the smoker.Once the temperature guage is reading about 200 degrees close the access door and adjust the bottom vents to half closed. Once the temperature climbs to 225 close the vents to about 1/4 open and further adjust as needed to maintain your target temperature. I usually recommend keeping it between 225-240 for almost all smoking. As you can see here, at grate level it is 225 degrees but in the dome it is still only showing around 200 degrees. 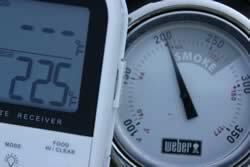 Once the smoker has been going for a bit, it will stabalize and the temperature will even out. My favorite meat thermometer is the Maverick ET-732.. it's remote and has dual probes. One is for the smoker temperature and one is for the meat. You can carry the receiving unit with you all over the yard and you always know what's going on in the smoker. I usually end up finally setting the bottom vents to about 1/8 open to maintain 225 degrees with the top vent about 1/2 open at all times. It will maintain this temperature for several hours. 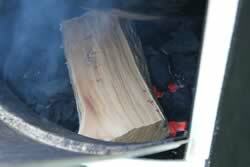 If after several hours the temperature starts to drop, this usually means that ash is building up on the coals. A good solid kick to one of the legs will usually make the ash drop down and the temperature will once again come up and stabalize at around 225 degrees. Be sure to keep a close eye on the water and add more as needed to keep the water pan full. I usually have to add water about every 4 hours or so. I recommend wiping down the outside of the smoker with a little glass cleaner and a paper towel after each use to keep it nice and shiny. I have had mine for several years and you can see that it looks almost as good as the day I bought it. I also take a minute or two to brush the grates once I remove the food and while it still hot. Spray a little water on the grates while they are still hot to create steam and help release the tough stuff. Doing this at the end of the cook instead of at the beginning of the next one will save you a ton of work and you'll find that you like the smoker already being clean for the next time you get ready to use it. Every once in a while when I dump the ashes out, I will spray the charcoal bowl out with a water hose and brush it lightly to remove anything that's stuck to the inside. I also recommend keeping a cover on the smoker when it's not in use. 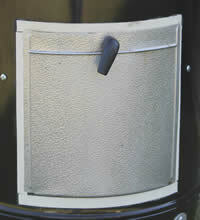 Mine came with a heavy duty cover that is rain proof and even in heavy rains, it keeps the water out of the smoker. I have been impressed with the quality of the cover in that has barely faded in the sun and is still keeping the rain out as good as the day I got it. That's been more than 2 years ago. I have not done any major modification to this smoker since it works so well right out of the box. The only thing I have noticed from day one is that the access door does allow air to get in and this prevents me from having complete control of the airflow in the smoker. To correct this situation, I went to my local Big Green Egg dealer and purchased a new felt liner. This stuff is fire retardant, about 1/8 inch thick and about 3/4 inch wide. 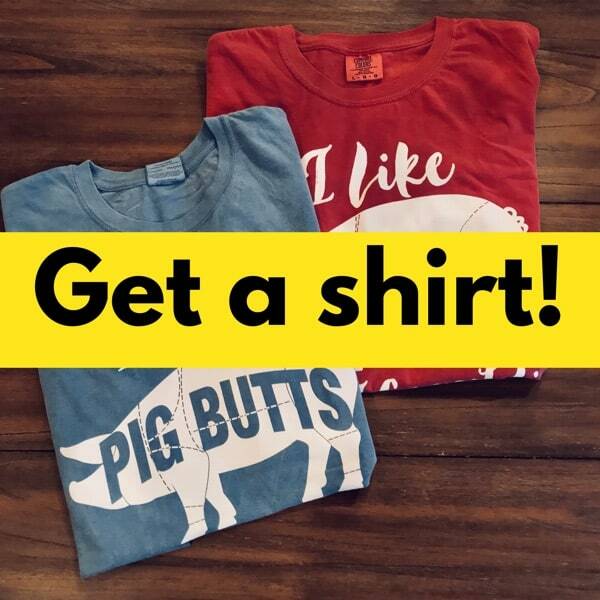 I bought the one for the XL since I wanted to have plenty but the Medium would probably be enough. I taped off the area around the door except for about 1 inch from the edges. I then sprayed Super 77 spray adhesive around the door and cut pieces to fit as seen in the picture. This created a near-airtight fit for the access door and I can now completely control the airflow using the bottom and top vents. 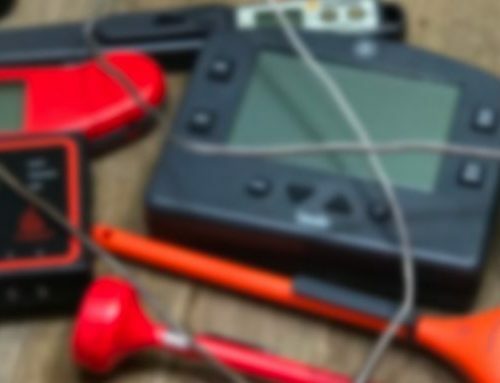 I do recommend letting the felt/glue cure for about 24 hours before using it. I will add more to this page as I think of things that need to be included. Until then, enjoy the WSM! Verdell, If you’re getting the charcoal smell, then you are using the briquettes? 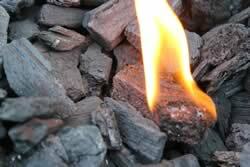 I’d recommend lump charcoal (actual charred wood chunks) over briquettes, but have use those in the past, as well. When I use briquettes, I use a lesser amount, get them burning good until the temp in the smoker is up, add soaked wood chunks to the fire, then dial back the vents to maintain temps. The only time I get that ‘briquette smell and taste’ to the food is if I don’t have enough draft, or my fire isn’t hot enough. Hi, Kara. depending on if it has an offset firebox, or not, I’d go about it a couple different ways. If the fire is built inside the tank, then a good, hot fire for an extended duration would cook off/dissolve most of it. Otherwise, I use a bio-degradable degreaser, get the smoker real warm (a hot summer day is good for this), and soak the interior walls down with it, let it sit, then a small flat shovel (like a gardening shovel, or an ash shovel for a fireplace) is used to scrape and clean out the remnants. I have a problem with the top grate falling down. Whats a good fix for this? The fix is simple. Take the three L shaped pieces out and add 2-3 washers behind each one. That will push the L pieces out and not allow the grate to fall off. Tip I learned on SmokingMeatForum.com and it works like a champ because I have the unit and did just that and smoke tons of food and have never had a slippage. 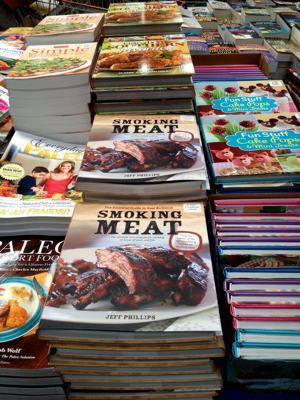 Does meat get cooked & smoked? Hi Sharon. Yes it does get cooked and smoked. It gets cooked slowly by the low, indirect heat. Great article on the WSM! I have had my 18″ model for three years and I love it. 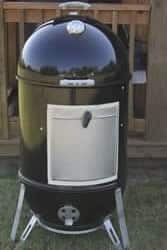 It was my first smoker and the one I learned on during a huge competion in NC. Can you provide a few more pictures if the door insulation process? I am also fighting the issue of controlling air flow from there. Thanks again for a great article. I learned several things about using my smoker. My problem is that everything I smoke ends up covered with ash. ?? What am I doing wrong? The water pan looks shallow – was that altered? Is it a different pan? I think it just looks that way in the picture. It holds about 2 gallons and, as far as I know, is the standard size for that smoker. Where can I go to get the flame retardant felt? Lowes? Home Depot? Thanks! I get it at places like Ace/True Value Hardware, etc. 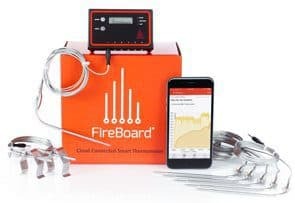 Any place that sells wood stove parts/accs. when i cook briskets, i’ve noticed that they stick to the grates. No matter how careful i be it still pulls some important bark off and fat as well. How can this be prevented? Non-stick spray?? What are your grates made of? Are they SS or something else? 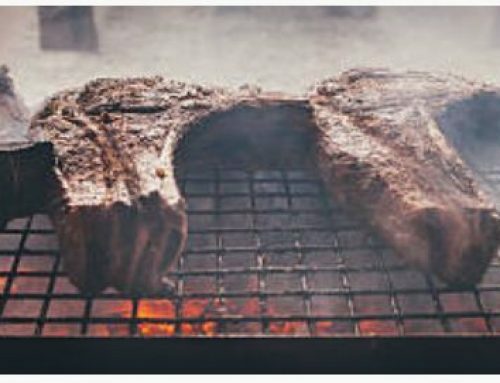 You can try poking a few holes in a large piece of parchment paper (to allow the grease to drain) and putting that between the brisket and the grate. 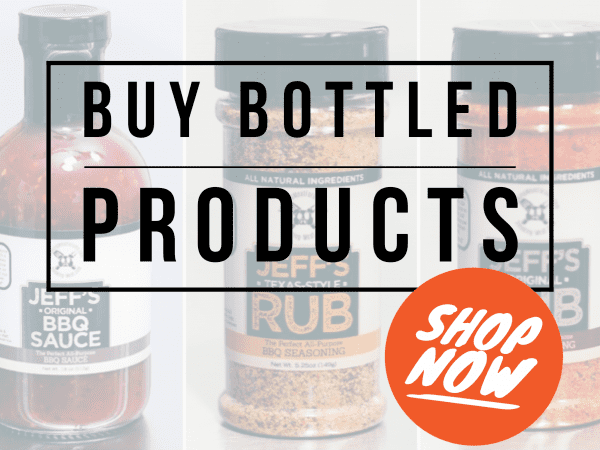 It can handle the heat and provides a non-stick surface that you are needing. Once it is on the grate, tear it to size removing any excess around the edges. I have not used this for brisket but often use this to keep fish from sticking and it works really well. I have to say that I thought long and hard before I purchased my smoker and I finally settled on the Napoleon Apollo As300 over the WSM. I think the contruction is as good as the Weber and the cost is a little less. And it has plently of room including the hooks inside the lid for hanging fish, ribs or sausage. No mods necessary. I am not sure why this smoker doesn’t get more play and reviews. I have an older 18 inch model with the Maverick dual probe. I put the meat thermometer into the meat and put the lid over the edge of the middle section. The lid sits on top of the wire and has never damaged it (yet). My older model doesn't have a built in thermometer. I drilled a small hole longitudinally through a wine cork and pushed the blunt tipped probe through it. Then I just push the cork into one of the holes on the top vent. Works great. You may have to whittle the inner end of the cork a little bit to make it fit in the hole. 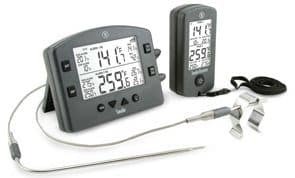 Hello, I was looking at possibly getting the Maverick thermometer that you have mentioned here and using it with the Weber Smokey Mountain. Did you have to make any modifications in order to get the probes inside and allow the lid to be placed on top? Thanks in advance for your help! The newer WSM‘s have a very handy rubber plug with a single small hole and a narrow slit that bbq probes go thru. The small hole is for a single probe and the slit is for dual probes. I just got my WSM and haven’t even fired it up yet. I was very pleased when I saw the plug, cause I had the same question. Hint: I struggled for an embarrassingly long time before I applied a little cooking oil to the outside edges and groove…popped right in! I have a Char-Griller Duo w/ fire box addition, and I think I've used the gas-grill side once. I've modified the charcoal side with ways to make it better, but it still needs more (air leaks are what needs the most attention.) Regulating temps seem to be the hardest, especially in cloudy or cooler ambient temps. 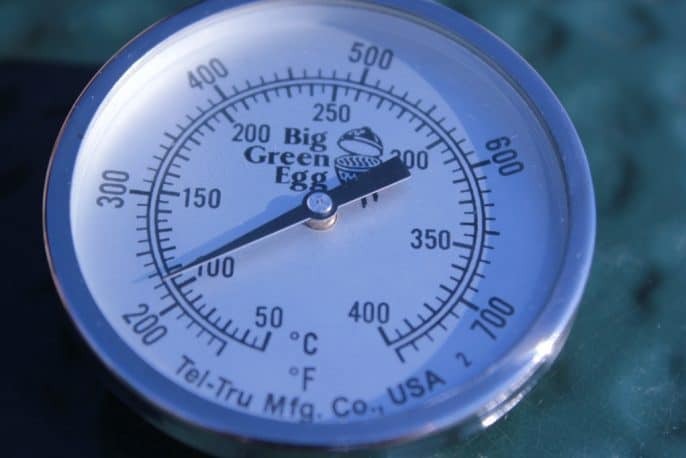 Does your bullet smoker struggle with temps in less than perfect weather? I'm in the process of making a bigger smoker from a fuel oil tank (275 gal) but I doubt I'll retire the Duo, and use it for smaller jobs, per se. 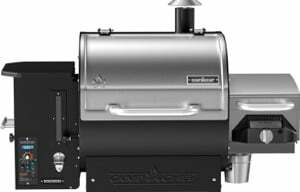 I have both the Char-Griller Duo and the 22.5" WSM. I have not used the Duo since I got the WSM a couple years ago. Initially it will tend to run a little hot and so you'll need to adjust the lower vents to hold a steady temp, but now I just set the vents to about 1/4 to 1/3 open before I load it up and will stay at 225-250 for 12-18 hours … regardless of the weather. It's a beautiful thing. Thanks, Mike. I may pick one up and give it a whirl. I'm also in the process of building a big tank smoker, as well.